In this weekend blog, we will go full hands-on and deploy Apache Kafka & Apache Zookeeper clusters using Strimzi operator on OpenShift 4. 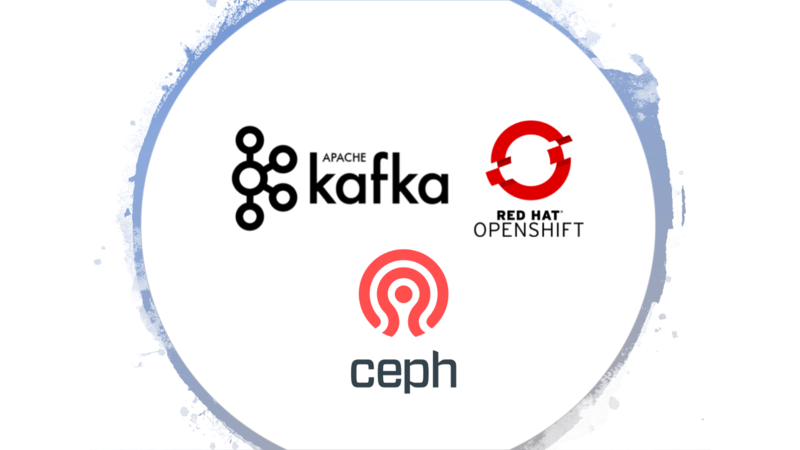 The persistent storage required by Kafka and Zookeeper clusters will be provisioned using Ceph which itself is running on OpenShift 4 orchestrated via the rook operator. You must have a running instance of an OpenShift or k8s cluster. You can follow my previous blog to learn how to deploy OpenShift 4 cluster. OpenShift client (oc) or Kubernetes client (kubectl) should be configured to talk to OpenShift / K8S cluster. You can follow my previous blog to set up a Ceph cluster using rook operator on OpenShift. For simplicity, the local development version of Ceph using filesystem directories as OSDs could also be configured using the rook operator. Here are point-to-point steps to set up a local rook-ceph environment. Before Rook operator can start provisioning Ceph block storage, a StorageClass and its storage pool need to be created. This is needed for Kubernetes to interoperate with Rook for provisioning persistent volumes. Option-1: Edit both storage classes and set is-default-class as false and true for gp2 and rook-ceph-block respectively. Verify your new default storage class. PS: This is an optional step, was introduced for simplicity otherwise storage class needs to be supplied every time while provisioning PV. Deploy Kafka producer and consumer application to verify the overall deployment. This will deploy a small persistent Apache Kafka Cluster with one node for each, Apache Zookeeper and Apache Kafka. The persistent storage for both Apache Kafka and Apache Zookeeper is provisioned using Ceph block storage. Verify persistent volumes and persistent volume claims, you will notice that PV for both Apache Kafka and Apache Zookeeper clusters were provisioned using Ceph block storage class. Once kafka-producer pod is initialized, you will notice Kafka producer console prompt, where you can submit any message that will get persistently stored in Kafka topic. > Maa : Well done my boy !! To read messages from Kafka topic, a consumer application needs to pull the messages. Maa : Well done my boy !! The Kafka cluster uses Ceph Block Storage persistent storage to store messages in the topic. Let’s create another consumer application and subscribe to the topic created by the previous consumer and try to read messages from the beginning. Cool 😎 , so we have learned to deploy Ceph cluster using Rook operator on OpenShift 4. Then we provisioned Ceph block storage via persistent volume and persistent volume claims using kubernetes storage class. We then deployed Apache Kafka and Apache Zookeeper cluster that used persistent volumes from Ceph block storage. Finally, we created Kafka producer and consumer apps to demonstrate Kafka messages are persistently getting stored on the Ceph cluster. PS: Strimzi is an open-source project that simplifies running Apache Kafka clusters on OpenShift or Kubernetes clusters and relies on Operator framework. Check out the project documentation here. 'Hello World', I am Sr. Solution Architect working @ Red Hat. Passionate about Serverless, Microservices, DevOps, Data Science, AI/ML.